Conservative leaders may believe it benefits them that one in six voters still thinks Obama is Muslim. But when conservatives sanction the debasement of Obama, they are debasing the presidency itself. A Gallup poll last year found that only 35 percent of Americans had confidence in the presidency. A Harris poll last month found that only 22 percent of Americans have a high degree of confidence in the White House." The outhouse with the name "Obama Presidential Library" displayed outside the state Republican Convention in Missoula this weekend, is drawing fire from across the country. But its builder said it's a political "spoof." The outhouse has provoked debate crossing all party lines. A Florence man built it, and before the convention, had it displayed at the Memorial Day Parade in Corvallis. It's a mobile political statement sparking a lot of emotion. 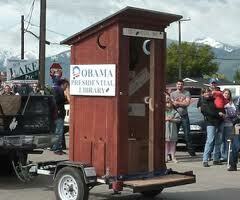 Dave Hurtt said he built the outhouse as a statement against Obama's policies. Outside are fake bullet holes. Inside, is a mockup of Barack Obama's birth certificate. There's also a sign that said, "For a good time,"...then the names Michelle Obama, Hillary Clinton and Nancy Pelosi. Hurtt said it's like old fashioned outhouse graffiti. "It's just a spoof," said Hurtt," a joke, maybe my humor is a bit crude for some people." This is not just a spoof. It is not humorous. 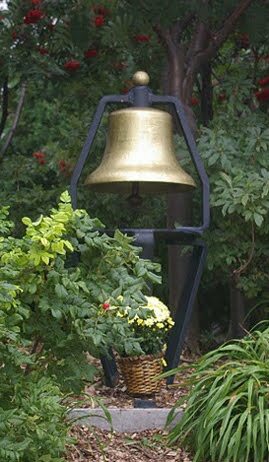 It is unwarranted, evil, vitriolic and below the belt attack on our nation's President. The man who created the outhouse is unrepentant. Shame on him. He and others like him don't seem to care. Anything goes with these folks. You can see the photo above. This photo is a prime example of the debasing of the President and the presidency referred to by Dana Milbank. It should not be tolerated but the right thinks anything goes. And it fits right in with the NRA's dark version of America. Rep. Darrell Issa's past includes arrests for weapons charges and auto theft, suspicions of arson, and accusations of intimidation with a gun, but you'd hardly know it from the media's recent coverage of the new chairman of the House Oversight and Government Reform Committee. While Issa was substantially mentioned in 15 articles in the nation's largest newspapers since the last election -- including several major profiles -- only one of those articles mentioned any of these allegations. Likewise, interviewers did not ask Issa about his alleged criminal past in any of the cable or network interviews he sat for during that period. So, where is common sense when you need it the most? If the media fails to report on the fact that a U.S. Congressman has been arrested and charged with many criminal counts in his past and then sits in judgement of the nation's Attorney General in an effort to take him down along with the U.S. President, we have a problem. The right has very selective focus. It doesn't focus on anything that is fact based, or negative about themselvs; for that they have right wing ideology/mythology as a substitute (in other words, pure fantasy). It is all part of a piece with rejecting objective reality, science, and truth generally. They are NOT the party of ethics or morality or any kind of values. Issa in particular is NOT a principled anything; he is just a thug in a suit who lies often if not well. Wow. This explains a lot about Issa. Being a gun nut and having been convicted of weapons charges, it only stands to reason that he throws his weight in with the gun extremists and NRA in trumping up the "Fast and Furious" debacle and using it as part of their "conspiracy" against the Obama administration. How did this joker even get elected?? Did his constituents realize he was a convicted criminal when they elected him? ?